Thurlton is one of the largest villages in this area of Norfolk, where hundreds of tiny hamlets scatter about the higher land between the marshes. Of course, that isn't saying much, and there is still a feeling of remoteness and calm. All Saints seems very old - a daft thing to say, I know, but the way the nave and chancel are thatched separately, the way the walls are battered and patched, and that old Norman doorway on the north side all contribute to a sense of an ancient place still doing what it does. Unusually in these parts, All Saints had money spent on the eve of the Reformation on beautifying its entrance - look at the porch, and that glorious south doorway, the angels censing in the spandrels. There are more angels, and crowns - but the crowns are mostly smashed. I wonder why? 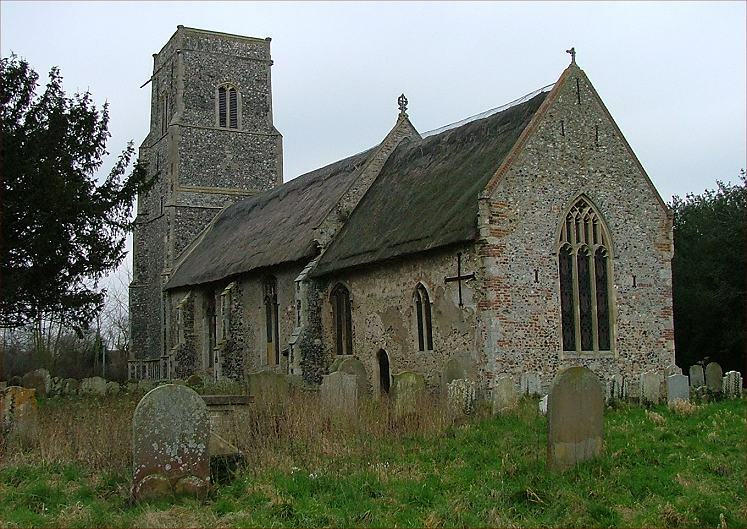 Thurlton was the home of the puritan Denny family, notorious iconoclasts in the service of William Dowsing, which might explain the crowns - but how did the angels survive? Inside, the nave is long and thin, and on this day in early February outrageously cold, much colder than outside. There are medieval survivals - the screen, with its panelling removed, a St Christopher wall-painting, the font in the local style. There are a couple of good memorials of the 17th and 18th century, but I liked the sanctuary best, the angel glass rather thrilling above the simplicity of the wooden table. There is a very odd arched alcove set low down in the north wall of the chancel. There's a picture below. I wonder what it was?